Why Choose Space’s Storage Moving & Storage Solutions? There are many benefits to choosing to move with Spaces Storage. Not only are our portable storage vaults easy to access, simple to load, and work with any budget but they put the fun back in moving. We make storage quick and easy with our portable storage containers. We will deliver as many as you request, right to your door. Our vaults make storing those Christmas decorations, patio furniture, and lawn and snow care items simple and hassle free. Simply load them into the portable storage vault and say goodbye until next season. More and more people are choosing to stay in their current homes rather than buying new ones. This means more people are choosing to remodel, renovate or improve their current house. Spaces Storage makes all of these tasks a breeze. You can keep a storage container right on your property while you remodel your home. Use it to store furniture, supplies, and equipment. Now you can work with your spouse and family to tackle those old house hold improvement jobs you’ve been putting off. We can make your garage cleaning fast and manageable while still providing quality and affordability. Use one of our portable storage vaults to organize your garage so that this year your car can actually go in! Our portable storage containers can hold approximately 1.5 rooms of furniture so one box should do an entire garage. If you have a bigger than normal garage or a mountain of items that need to be removed then you have the option to order two or more containers. The great thing about us is that we only charge you for what you use. If you order 3 and only fill 2 that’s no problem, you won’t be charged for containers you don’t fill. 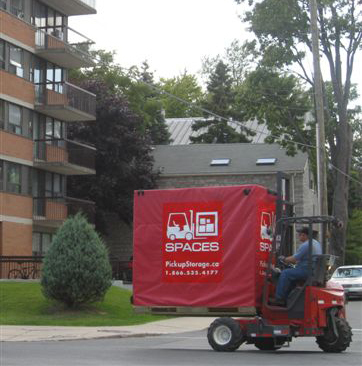 Spaces Storage conveniently sized portable storage containers are the perfect addition and storage facility for your work site. Are you a contractor that bounces from job to job and need a place to store your tools and equipment? That’s no problem with Spaces Storage. We will move the container to anywhere you want at one low affordable price. Worried that your belongings might get stolen on the worksite? We fix that problem by insisting you use pad locks to lock up your vault. Don’t have a pad lock? We sell secure pad locks and will deliver as many as you need right to your door. Our portable storage containers are the number 1 solution to all of your business expanding and on the go needs! Contact us today and jump on board for an exciting new concept to storage and moving!